Unless you’ve been living under a rock, you’ve probably heard of the incredible blue ice caves in Iceland. Sometimes called crystal ice caves, these rare and picturesque natural wonders have been appearing more and more on Instagram and Facebook, and can look like something from another planet! “Ice cave” is a rather broad term, and can include any regular bedrock cave where patches of ice, icicles, or other ice formations can be found. Glacier ice caves, on the other hand, form inside—you guessed it—glaciers. This is an important distinction, because those incredible images you see of brilliant, translucent aquamarine ice caverns are glacier caves. And lucky for us, Iceland is home to some pretty amazing glaciers! How are Blue Ice Caves Formed? 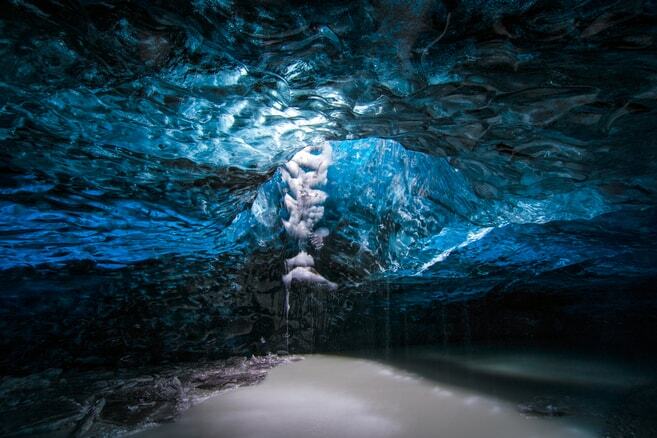 Most glacier caves have water to thank for their existence. Water melts on the glacier’s surface, enters the ice at a crack or moulin, and trickles down through the glacier before exiting at base level. The water gradually erodes the ice and causes more melting, which enlarges the cavitation over time. In the spring and summer, the sun and warmer temperatures cause accelerated melting, and powerful flows can carve out impressive caverns and tunnels. In the fall and winter, the colder temperatures re-freeze and stabilize the caves. This yearly cycle means that the glacier caves are constantly changing and transforming- the same ice cave will be distinctly different from one year to the next, and more subtle changes can be noticed even by visiting the same cave several times in a season! Sometimes glacier caves form due to geothermal activity, and there are a few great examples of this in Iceland. In this process, geothermal heat from volcanic vents or hot springs carve out caves in the ice. 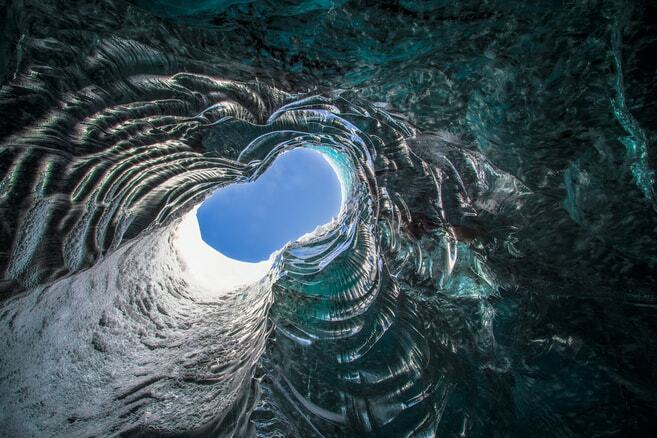 Some ice caves in the Vatnajökull glacier were formed this way. Click here to see our wide selection of ice cave tours. 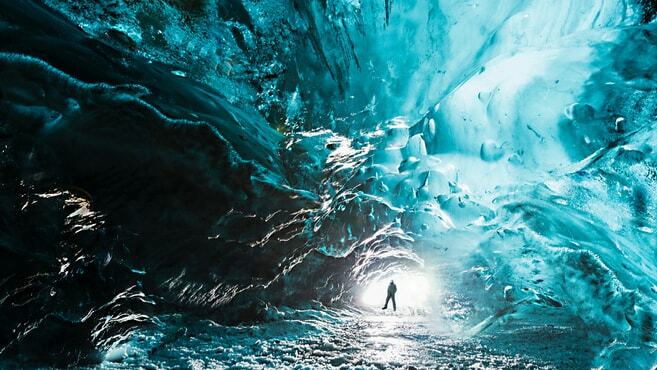 The most important rule for visiting Iceland’s glacier caves is to never, never go in alone! You must join a tour with an experienced guide. The glacier caves are complex structures with lots of little features that can be easily missed by the untrained eye. Your tour guide will provide you with the necessary safety gear and help you avoid any missteps, like falling into a hard-to-spot crevasse, never to be seen again! You’ll make it safely into the ice cave and back out again, with incredible memories and photos to share with friends and family. Since you’ll be visiting during the coldest months (and surrounded by ice!) you’ll want to be sure you dress appropriately. I recommend layers, starting with a good wool or blended fabric, followed by a layer of fleece and then a light, waterproof jacket. A sturdy, waterproof pair of boots with some grip, warm wool socks, and a hat and gloves will keep you comfortable as you explore the icy caverns. The weather can be unpredictable and sometimes the ice caves are wet and dripping, so it’s not a bad idea to bring waterproof protection for your camera, as well. Your visit to Iceland’s crystalline blue ice caves will be unforgettable and totally one-of-a-kind. Since the glacier caves are in constant transformation, you’ll be experiencing a unique moment in history that won’t be repeated. How cool is that? If you have any questions, just reach out to us! And this winter, come to Iceland and see the wonders of the stunning ice caverns for yourself.